We love your picture. Those eyes and ear coloring are wonderful! 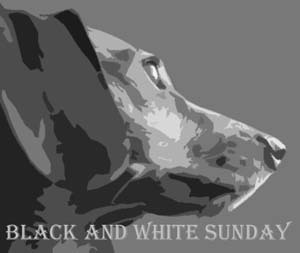 Happy Black and White Sunday! Lovely picture even in black and white! We use an app for Android called Picsay. We do everything with it. It is easy to use. The upgrade is only $2.99 and worth it! Licks and Wags right back at ya! Hope you're having a happy Sunday--You sure look like it! I love your big smile! Aww! You look so sunny and happy! That's a great picture of you! Dina, you look so happy. Did you find a giant leaf pile to jump in? Have a marvellous Monday Dina. Hiking With My Mom (aka disaster)! I'm Too Young to be One!